Check out our brand new Murphy desk-table cabinet. Tupper is excited about this beautiful space saving cabinet style. His design is the perfect compliment to your Murphy bed cabinet or as a stand alone unit. Imagine using a desk or table when you want it, then hiding it away. The convenient shelving, top and bottom, allows you to stow office, kitchen, or even art supplies! Maximize the space in a bedroom, office, kitchen, living room, efficiency apartment, tiny home, or cabin! 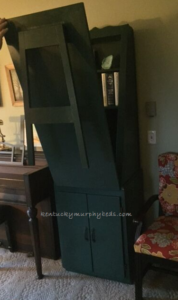 Murphy Beds of Central Kentucky innovates and designs furniture to make the most of small living spaces. This desk-table cabinet is built with your choice of woods, finishes, and size specifications. Tell us what you like about this great new desk-table option. How would you use it? Check out our website for more pictures. Call or email us to get started on your furniture designs today. 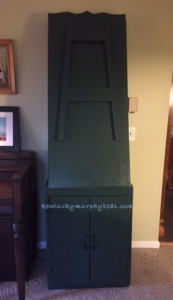 Murphy Beds of Central Kentucky custom designs bed cabinets and accessory furniture for any room in your home. We offer a variety of woods, finishes, and designs to fit your personal taste and budget. All of our products are hand crafted by skilled cabinet makers for years of enjoyment. 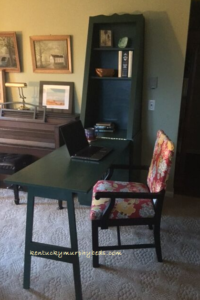 Owner, Tupper Hardman, comes to your home to design your one of a kind Murphy desk – table cabinet and a Murphy bed too. We design and install our products for your absolute satisfaction. Contact us today to schedule a free in home design session.